AS Scenario interiørarkitekter MNIL and Mellbye Arkitekter have created a relaxed, welcoming office space for Norwegian law firm SANDS, located in Oslo, Norway. SANDS is one of Norway’s biggest law firms, with over 140 lawyers working from five locations in Norway. Scenario Interior Architects and Mellbye Arkitekter were commissioned to renovate their Oslo office in the downtown Vika district in Oslo, Norway, where a derelict art institute was being joined with an adjacent building to create one central office space. They wanted a relaxed, welcoming space. Not too bold, but it needed to have a sense of quality in materials and surfaces. Scenario combined classic design languages with bold and humorous furnitures. By example, the horse from Moooi Design by the front is placed next to the reception desk in a wooden “cathedral “ at the top of the building. The old building had a challenging top floor with skylights and a sloping roof with very low breeding height. It would be natural to choose this area for internal features, but there was potential in adding part of the meeting room along with the reception. Scenario sought to dress the entire floor, walls and ceilings, with oak so that the “old ceiling” could disappear and a new modern and pleasant area was created. One enters this top floor by taking the glass lift and overlooks the city from the 1st floor up to the 6th floor. From being “the difficult floor”, this area was transformed into the office’s most beautiful area. In addition, the architect gave the reception area a “view plateau” where one looks far beyond the city and in to the Oslo fjord. 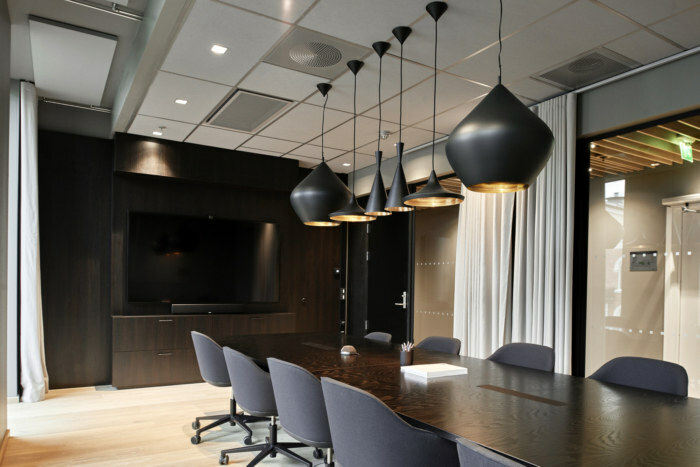 The meeting room area is in a slightly low-key, dark color scheme combined with white-pigmented oak floors, large beautiful glass fields, black doors, black tea-kitchen in black oak and a wooden ceiling that is far beyond any standards. This is following throughout the hole mingle areas both in the 6th floor and part of 5th floor. 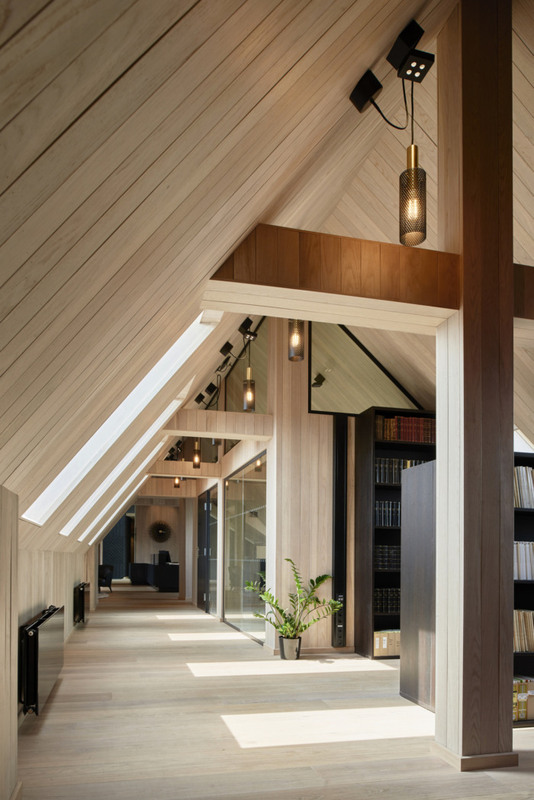 The lighting in the wooden ceiling especially adapted to and fitted to maintain enough light for the areas. The 1st floor houses the auditorium, which is used for courses and conferences. There is also a cozy canteen and a large beautiful room with a 5 meter tall fireplace. 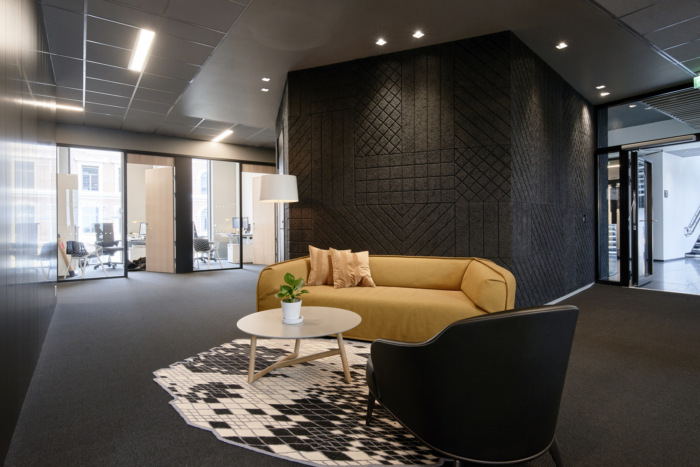 The offices are located between floors 2-5 where the lawyers have their own home areas with coffee zones and various seating possibilities in pleasant surroundings.